Every mother thinks her kid is beautiful. None of us are exempt. But when you see babies so much in your occupation, or even when you work with kids, you know. You just know. There really is such a thing as ugly children, regardless of age. There are even kids who may be physically pretty, but are so obnoxious that they are ugly. You know, even though it may not be politically correct to say as much, that I am right on this one. E was a pretty kid. He still is. When he was a newborn, he was even beautiful, though most newborns are decidedly not pretty. But he had that perfectly round c-section head. His skin was soft and flawless, despite months soaking in amniotic fluid. He had a slight case of newborn jaundice, which was not enough to require treatment or make him ill, but just enough to make him look like he had a tan. He was big for his gestational age, but still petite. As he grew, he remained small, so he would be walking and people would be struck by him because he looked way too young to be able to do so. We got attention everywhere we went. But some attention you just do not want. I was blissfully ignorant back then. I didn't work in health care. I knew nothing of MRSA, VRE, C.Diff, and more. There was no swine flu. And people would come up and stroke his little cheek or otherwise put their hands on him, and I was too polite to tell them to not do so. But now, I know too much. And since we are anticipating Zachary to look just like Big Bro, I am seriously thinking of doing this, though I find it completely hilarious. Please. Don't. Touch. The. Baby! I must admit this is not my picture. I stole it from here. You can incidentally purchase these labels by visiting the link. I must say, I cannot look at the picture without laughing. I doubt I will really do this. But the fact that there is even a market for such a thing astounds me. Why would someone come up and touch your kid? But I know they do. So anyhow, I had to share. I am worried about the same thing. I think, if your baby is even a hint of cute, people will want to touch. 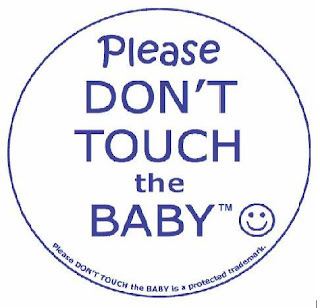 Keith has this survival guide for dad's that explains how to deal with people who ask to touch the baby. Something like "Sure, his rash isn't contagious anymore, I don't think..."
or "Sure, he hasn't projectile vomited since yesterday." I was hoping that by simply wearing the baby in a wrap or carrier, people would not be able to touch him because he'd be so hidden from view. But it probably would just make him even more accessible, since they wouldn't have to bend over. They find a way! Trust me! I love the "rash" comeback! Awesome.